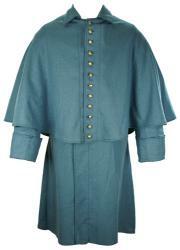 Civil War Union Foot & Mounted Great Coats Made in USA. While the Great Coat was standard issue for both Union & Confederate soldiers, that doesn't mean every soldier received one. The Great Coat is the one item of your uniform that will be the most appreciated as protection against all but the worst weather. It even doubles as an extra blanket. 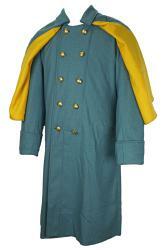 The C&C Sutlery M1851 US Enlisted Foot Greatcoat is worn by Infantry, Heavy Artillery, Hospital Stewards and Engineers. The US Enlisted Foot Greatcoat is a Single Breasted 5 Button Front Coat with a 6 Button Elbow Length Cape using Federal Eagle Buttons. 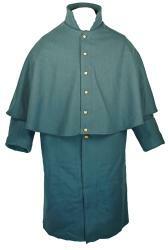 The Coat features a Stand Up Collar and Fold Down Cuffs. Here is a link to a good article: The Great Coat & Why You Should Have One . 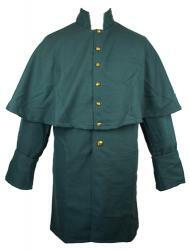 Also discussed are other outerwear garments used during the Civil War.